I have two small lines of text with different width. I want flush them right keeping their left justification and the line height of previous text. 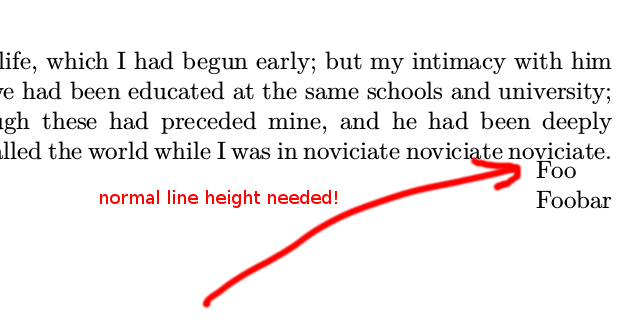 I was yet young in life, which I had begun early; but my intimacy with him was of a recent date: we had been educated at the same schools and university; but his progress through these had preceded mine, and he had been deeply initiated into what is called the world while I was in noviciate noviciate noviciate. You can use a tabular with [t]op alignment. But using primitive boxing commands in LaTeX is not recommended. Not the answer you're looking for? Browse other questions tagged horizontal-alignment vertical-alignment or ask your own question.